Being a renowned firm, we are engaged in manufacturing, supplying and distributing a wide range of Spectrum Analyzers. These products are well equipped and ensure long lasting service life. GSP-9300 is a light, compact and high C/P ratio 3GHz spectrum analyzer. The GSP-9300 frequency range stretches from 9kHz to 3GHz and features many functions such as radio frequency and power measurement, 2FSK digital communications analysis, EMC pretest, and active component P1dB point measurement, etc. It can support the fast sweep speed up to 307us. It is the ideal instrument for various application fields such as the basic operation of R&D, research and school lecture, engineering maintenance and test for mass production. 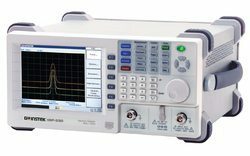 This light and compact spectrum analyzer is also suitable for automatic test systems and vehicle mounted operation. GW Instek understands that high quality is very important consideration for users who are selecting economical spectrum analyzers. GSP-9300, with the built-in preamplifier and the highest sensitivity of -152 dBm (1Hz), is capable of measuring very feeble signals. To obtain the accurate results, the low power measurement uncertainty of GSP-9300 is less than 1.5dB. 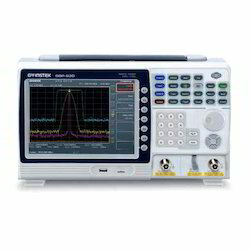 The built-in measurement functions of GSP-9300 spectrum analyzer unclude 2FSK digital communications analysis, AM/FM/ASK/FSK signal demodulation & analysis, EMC pretest mode, Harmonic Distortion, TOI, Channel Power, OCBW, ACPR, SEM, Phase Jitter, N-dB Bandwidth, Noise Marker, Frequency Counter and Time Domain power measurement for burst signal, etc. Tracking generator, an option for GSP-9300 spectrum analyzer, provides supplementary functions such as measuring the insertion loss of RF cable and identifying the frequency response of antenna, filter or amplifier. The P1dB measurement function supports power sweep and P1dB compression point of active component. It supports 6.2GHz power sensor PWS-06. User, via the power meter mode, can conduct related measurement applications without using an independent power meter. 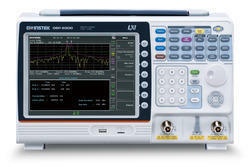 GSP-9300 spectrum analyzer is very user-friendly. All frequently used functions can be applied quickly through function keys and five languages (English, Russian, Traditional Chinese, Simplified Chinese and Japanese) are available for user interface. Users can use the external software Spectrum Shot for EMI test report management and assessment, remote control and waveform data recording for long periods of time. Spectrum Shot can be applied to spectrum monitoring for detecting any abnormal radio signals. The software will send out e-mail to inform users if any abnormal situation occurs. To summarize, GSP-9300 spectrum analyzer is a perfect, light, compact and economical measurement instrument. With height of 210mm and width of 350mm, GSP-9300 is suitable for automatic test systems. It can be mounted on the 19 inches 6U rack. The light and compact design of GSP-9300 is ideal for vehicle mounted operation to carry out field strength measurement such as monitoring satellite communications signals. Our company is involved in providing a wide array of GSP-930 is a Spectrum Analyzers. We designed this product upon a new generation platform. These Spectrum Analyzers are highly admired among the customers for their high stability, light weight, large screen display and compact size. The superior features of our product such as topography and spectrogram increase the application range and raise their significance in the role as the matchless RF analysis device. 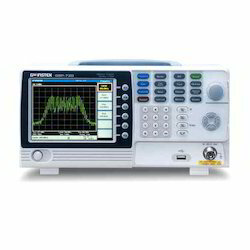 We are engaged in introducing a broad assortment of Spectrum Analyzers. We designed this Spectrum Analyzers to fulfill the desires of RF Communication educations. It is obvious that insufficient teaching tools and budget constraint are the two obstacles for schools to give high-quality courses for RF communication experiments. Our product is a moderate spectrum analyzer, featuring full functions should provide, along with GRF-1300 training kit possesses a unique position in the field as an economic turn-key solution for 3GHz RF communication experiment courses. With its components, GSP-730 Spectrum Analyzer, GRF-1300 Trainer and a PC, properly related, a tangible system is integrated for performing ongoing experiments while the lecture is given. Using a PC, the teacher can present teaching material with power point slide and concurrently manage GSP-730 and GRF-1300 to perform experiments and get spectrum displays and parameter readings on the PC screen. GSP-730 and GRF-1300 move the current teaching materials, including the textbook, power point slides and remote control software, into electronic-teaching system. We are offering a huge range of Spectrum Analyzers to our customers. Our Spectrum Analyzers are the latest evolution from GW Instek and these are known for their uncompromised design, high performance, and remote monitoring software. Our product has an outstanding noise floor of -152dBm/Hz that is joint with the optional GAP-802 preamplifier, the noise floor can reach -172dBm/Hz. This is than capable of finding limits and available with a low noise floor. Our product is an ideal solution for spectrum analysis due to its trace detection and because it is combined with an easy-to-use interface. Moreover, the advanced users can describe their own macros in 10 sequence sets by using the auto sequence mode. The repeat or single run mode of our product can be used to make more efficient repetitive tasks. PC connection is effortless and versatile supporting RS232C, USB host/device, VGA and GPIB (optional) for remote controlling, monitoring and analyzing. Our company is the highly appreciated by customers for providing client specific Spectrum Analyzers to them. It is a digitally synthesized, user friendly RF measurement instrument with a frequency range around 1GHz. The compact design with a phased-locked RF system of this product combines performance and measurement quality with an affordable price. Our Spectrum Analyzers is also fabricated for rugged use with 1-watt input protection. With a compact size and feature packed functions, this product is an expandable, affordable and high quality instrument for the most demanding requirements.